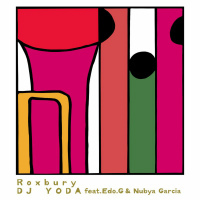 So it is that DJ Yoda ends a four year break from studio releases with the arrival of new single Roxbury featuring Boston mic veteran Edo G and up and coming jazz saxophonist Nubya Garcia. And it’s so good I might have to forgive him for the time he tried to ‘house’ me at the Bristol Lakota. From the off, the beat radiates a summery warmth nodding to both ’89 era Native Tongues and Guru’s 90s Jazzmatazz adventures while Edo G simultaneously honours his birth neighbourhood and unloads a two and a half minute message of self-belief and positivity. That’s hardly the end of proceedings though, for after Edo G bows out, Garcia gets all Lisa Simpson for a one and a half minute outro of floating sax solo.